Bread Espresso Dessert Cafe (BED) @ Ipoh - Always Travelicious ! The BED Cafe, short for Bread, Espresso, Dessert, is quite a cute and unusual name for a cafe. I can imagine a bar or night club called “Bed”, and I think I remember seeing a night club somewhere on the internet which uses big beds for seating instead of the conventional tables and chairs. If you hear a Ipohrian say “Let’s go to BED” – that probably isn’t as naughty as it may sound. The cafe’s interior is sweet, homey and permeates with the smell of freshly baked pastries. Their coffee seems more affordable compared to other pricier cafes. I didn’t get any coffee on that day as it was late in the afternoon and I won’t be able to sleep at night if I had any. The smoked duck breast with carrot bun (RM 14.50) is a pleaser with glistening bread-top that is delicately crisp; and the smoked duck breast pieces plump and turgid. The smear of mustard sauce adds an extra zing to the sandwich while there is too much mayonnaise masking the original flavors of the smoked duck, which is sweet enough to stand alone. The Jasmine Matcha Verrine is tantalizing with colors, tasting very similar to a denser version of mascarpone cheese. The white layer is the original unaltered flavor, the green is of course the green tea, while the pink is supposed to be jasmine, though it tasted very much like raspberry. A fulfilling dessert that was too heavy to be finished on my own. A few more of their dessert items in the fridge. I took away the “bread muffin” from the range of freshly baked goodies. I thought it would be a hybrid texture, like the cronut, crogel, and cragel; it was actually bread with chocolate chips baked inside paper muffin cups. It was nice, but I expected a novel texture. Nonetheless, the freshly baked items are still a plus point for the cafe. i love the coffee there! I’ll give it a try next time if I am not there too late in the afternoon! 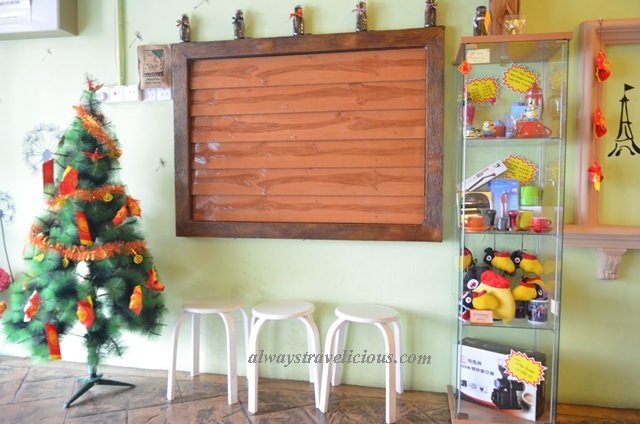 Pingback: Potpourri House Cafe @ Ipoh, Malaysia | Always Travelicious !